Adventurous, charismatic, good-looking, and one-time cover boy for Time magazine, James Henry Breasted sounds quite the dashing Indiana Jones. But he was also one of the most important scholars of modern times and a talented author, who demystified ancient Egypt, and brought the excitement of discovery and excavation to an enthralled public audience. This book is the first comprehensive biography to include full coverage of his work and research. Breasted was born in 1865 in small town Illinois, his early life shaped by the fallout of the American Civil War. 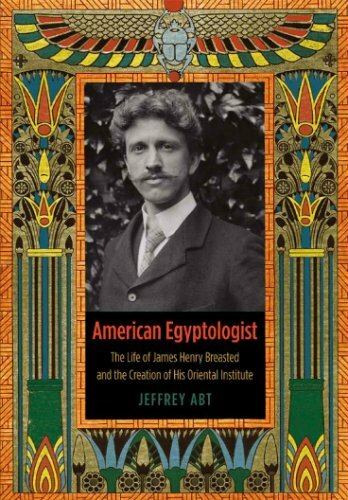 He studied Hebrew, Greek, Egyptian and Arabic at Yale, before enrolling at Adolf Erman’s new School of Egyptology in Berlin and becoming the first American to receive a Ph.D. in Egyptology. He spent his honeymoon in Egypt collecting antiquities for the University of Chicago, where he later founded the Oriental Institute (funded by John D. Rockerfeller Jr.), an inter-disciplinary research centre to study the rise and development of Western civilisation from its roots in the ancient Near East. The work of Breasted and the Institute revolutionised our understanding of Egypt, Nubia, and the ‘fertile crescent’, the term he coined to describe the archaeologically important area between Iraq and Israel. Breasted directed the first expeditions of the Institute, working at Megiddo, Persepolis and Medinet Habu, compiled a record of every known Egyptian hieroglyphic inscription and published a translation of these in a five-volume work. Breasted’s admirers included Teddy Roosevelt and Sigmund Freud, and he was called upon to mediate in the dispute between the French, British and Egyptians over the discovery of the tomb of Tutankhamun (which he helped to identify). He died in December 1935, and his grave is marked by a granite block from Aswan, only fitting for the man who was known to his peers as ‘the father of American Egyptology’. The book is well-illustrated with black-and-white photographs and diagrams, backed up with extensive notes and bibliography, and its beautiful and colourful dust jacket will certainly brighten up your bookshelves! 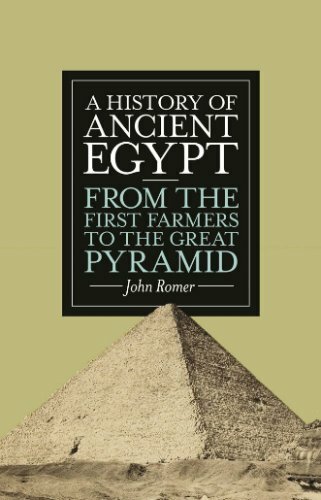 This is the first of two volumes which the author promises will give a fresh approach to the history of ancient Egypt, peeling back the layers of confusion he feels were added by successive generations of modern study, and putting ancient Egypt back into its proper context. Taking into account the last forty years of academic research and excavation work, Romer claims he is starting from nothing, casting aside old ways of thinking. There are no “pukka pharaohs” (kings who are just ancient versions of modern western rulers); as Romer points out (possibly with his tongue in his cheek) the “T-shirt-wearing Landrover Man of ‘corny’ TV documentaries” is the result of fifteen thousand years of human culture, and it is the difference between him and the first Nile occupants that holds the clue to understanding the extraordinary history of ancient Egypt. This first volume traces the origins of Nile civilisation from the arrival of the earliest nomads to the construction of one of the greatest monuments ever built, the Great Pyramid of Khufu, and the story begins with three hundred storage bins. According to Romer, these ancient remains in the Fayum represent “the single greatest transformation the human race has ever undertaken”: the shift from hunting and gathering to husbandry and farming. From this point it took just fifteen hundred years for the Egyptians to become pyramid builders. The book is divided into five sections, beginning with ‘Making Culture’, which explores the earliest settlements from the Fayum c. 5000 to 4000 years BC, community development at Merimda, the Badarians, and the Naqada period, describing in detail the fragmentary archaeological evidence: pottery, fragments of linen cloth and cylinder seals and burials. In ‘Making Pharaoh’ Romer argues that Narmer is the earliest king we know of with any certainty, dismissing the idea that the shadowy figures of Scorpion and Hawk can be thought of as individual rulers based purely on their proto-hieroglyphs. The true origins of the Pharaonic State he says lie in the middle of the fourth millennium BC when the Naqadan people took to boats and spread further up the Nile. Other sections focus on ‘Making a Kingdom’, the Step Pyramid and the evolution of the pyramids, covering a wide range of topics including the origins of hieroglyphs, rite and sacrifice, the serekh tomb, country life and Imhotep, the “Egyptian Leonardo”. The work is compellingly written and well-illustrated with colour photos and black-and-white line drawings, and includes a chatty chapter-by-chapter bibliography. A good introduction to the foundations of ancient Egypt for both the serious student and general reader. 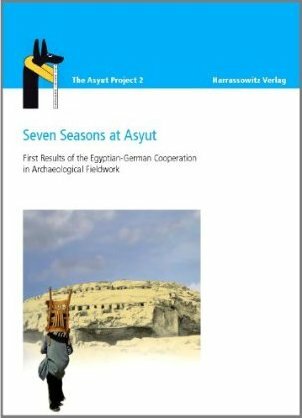 Seven Seasons at Asyut: First Results of the Egyptian-German Cooperation in Archaeological Fieldwork. This volume represents the proceedings of an international conference at the University of Sohag, in Egypt, 10th - 12th October, 2009, with the aim of publishing the results of seven seasons of Egyptian-German collaboration at the necropolis of Asyut. Located in Middle Egypt, about seventy kilometres south of Amarna, Asyut is an important site, and many of the objects discovered there (dating to the First Intermediate Period and Middle Kingdom) are displayed in museums across the world (e.g. the wooden models of armed troops from the tomb of the nomarch Mesehti and the coffin of Wepwawet-em-hat with a diagonal star clock on its lid). Texts from Asyuti tombs of this period were copied on monuments and papyri throughout Egypt from the New Kingdom to the Roman Period, including in the tomb of Senenmut (TT 353). Not only was the ancient town a centre for high quality craftsmanship, Asyut also played the role of border town on many occasions because of its location in the centre of Egypt. The town served as a crossroad along the Egyptian trade routes, and its direct link to the south made it vulnerable to incursions, which explains the high number of weapons (both real and model) found in the area, and why the nomarchs were depicted in their tombs with their troops. This makes the area a good study object for regional diversity within Egypt; but as much of the ancient city lies hidden beneath the modern one, the Asyut Project team are concentrating their fieldwork in the western mountains, in the Gebel Asyut al-Gharbi. In volume two of the project’s publication, topics covered include the nomarchs of the First Intermediate Period and Middle Kingdom, New Kingdom tomb graffiti, epigraphic work, the reconstruction of the Middle Kingdom Tomb of Siut II, and studies of Islamic pottery, human bones from Old Kingdom tombs and historic plant records. The book is well illustrated with line drawings, black-and-white and colour photographs, maps and charts, and indepth bibliographies. 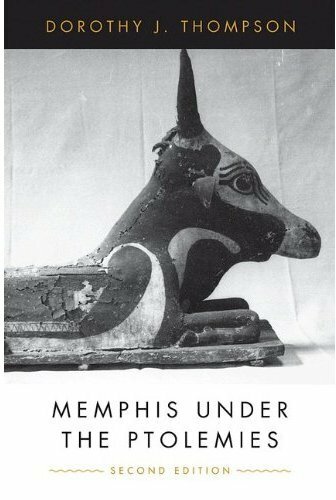 At three hundred and thirty eight pages, this is a comprehensive and thorough investigation into the ancient Egyptian city of Memphis during the Ptolemaic era. Originally published in 1988, the Second Edition has been updated and revised with the results of recent archaeological findings and new translations of textual material. Throughout much of Egyptian history, Memphis was seen as the capital of Egypt. It was the main port and administrative centre, and was fabled throughout the ancient world for its sights, temples and wealth. This situation was to change only after the conquest of Alexander the Great, when the city of Alexandria was created, thus making Memphis into the ‘second city’ of Egypt. The city, therefore, as the author puts, it “provides a unifying context for material relating to various aspects of life in Egypt under the Ptolemies”. Chapters relate to the city itself, its economic life, and the ethnic minorities it contained. The Ptolemies and their relationship with the many temples of Memphis are considered, as is the work of the undertakers and embalmers of the city, the cult of the Apis bull, and the vast burial place of the Serapeum. A final chapter looks at Memphis in Roman times. The text of the book is closely packed and authoritative in its presentation of the facts. Whilst this is not an ‘easy read’ the text is surprisingly readable and engaging. Indeed there is so much to be learned from these pages that one wants to turn the page and read on, and once a chapter is started it is difficult to put the book down. 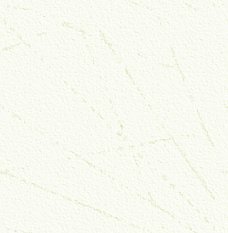 Regrettably illustrations are generally sparse and the majority of these are devoted to family trees. Only eight black-and-white photographic plates are included, which is a disappointment as additional plates would have given the reader a greater contact with the subject matter discussed in the text. In short a masterful piece of scholarship looking at a complex and often overlooked period of Egyptian history. A book that any serious student of the Ptolemaic Period, or the Hellenistic world, would greatly benefit from reading. Princeton University Press; 2nd revised edition 6th Mar 2012. Paperback, price: £24.95; also available as hardback, price £52.00. An invaluable member of the AE team, Victor prepares the information for our Events and Society pages as well as writing the regular Netfishing feature. Archaeology is not an exact science: as the scant remains of previous civilisations are unearthed, their interpretation depends entirely upon the prior knowledge and experience of the excavator. Much of the interpretation is necessarily based upon educated guesswork. As the accumulated knowledge of the past increases over the generations, and the methods of excavation and recording become ever more sophisticated, so the interpretation of previous discoveries can be proved to be mistaken or inaccurate. 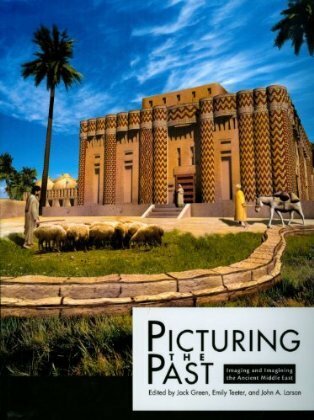 This volume is the catalogue of a special exhibition appearing from 7th February to 2nd September 2012 at the Oriental Institute Museum, University of Chicago, and contains a series of essays describing the way in which recording and interpretation have developed. The majority of the articles relate directly to ancient Egypt and the authors include a number that will be well known to readers, such as Ray Johnson of Chicago House and Nigel Strudwick, formerly of the British Museum. Beautifully and lavishly illustrated throughout in colour and black-and-white (with 168 illustrations in its 184 pages), the book contains a huge number of rare archive images and reconstructions. I found it fascinating. Campbell Price continues our series rediscovering classic Egyptology texts, with a must-have book for all Egyptologists. There are many works that one could cite as ‘classics’ of Egyptological literature, each for a different reason. 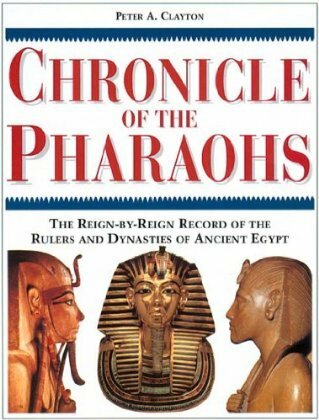 One title that stood out during my own formative years was Peter Clayton’s Chronicle of the Pharaohs, first published in 1994 and reissued in 2006 to match Joyce Tyldesley’s volume on Queens. Although it is an international bestseller, Chronicle rarely appears on student reading lists or bibliographies. It has been overshadowed on one hand by heavier academic tomes and by popular pap on the other. Yet this does both the book and the author a great disservice. In style, the Chronicle is simple, accessible and evenly presented. Like countless other history books, it attempts (successfully) to present a very long and only incidentally-known history in the form of a readable narrative. Yet the text doesn’t sidestep complexities, but addresses them in a concise manner. For readers unfamiliar with Egypt’s periods of decentralisation, a particularly helpful feature is the timeline running throughout the book that shows the overlapping reigns of several kings. Royal names are given in hieroglyphs, in a consistent format – a useful tool for keen readers to recognise cartouches on genuine objects. Clayton manages to bring out the colour of individual historical episodes, including moments of modern archaeological discovery. The readability of the book reflects the author’s broad background and obvious ease in presenting history in an engaging fashion. As an advisor on treasure valuation to the UK government, Clayton clearly knows how to recount a tale of discovery. Indeed, new discoveries are common in Egyptology. They constantly amend – rather than simply improve – our understandings of what we think happened in ancient Egypt. Yet, there is little here that now requires serious revision. Despite being published almost twenty years ago, Chronicle retains its use as a reliable summary of key events of a reign or period, and how they interconnect with each other. It is perhaps a cliché to describe a book as inspirational, but in my case it is appropriate for Chronicle. The book inspired me directly – at the age of ten – to create my own royal lineage of paper cut-out pharaohs. For some reason, I focused on the Fifth Dynasty. I even went out and built my own pyramid (using rockery stones and mud from a flowerbed) in honour of King Userkaf – much to my parents’ annoyance. It is a testament to this book’s clear presentation of information and engaging narrative that it fired the imagination of a schoolboy, albeit one whose interest in ancient Egypt had already been sparked. Chronicle remains a very useful first-stop guide, and one that I still recommend as an easy ‘way in’ to the daunting delights of Egyptian chronology. Campbell Price Dr. Campbell Price is Curator of Egypt and Sudan at The Manchester Museum.